When 'The Horde' and David Dunn are apprehended by authorities, they are placed in a mental hospital where Mr. Glass is also being held. While at the hospital, psychiatrist Dr. Ellie Staple tries to convince the three of them that they are suffering from delusions and that they don't really have powers. Mr. Glass may be concocting a plan to prove otherwise. 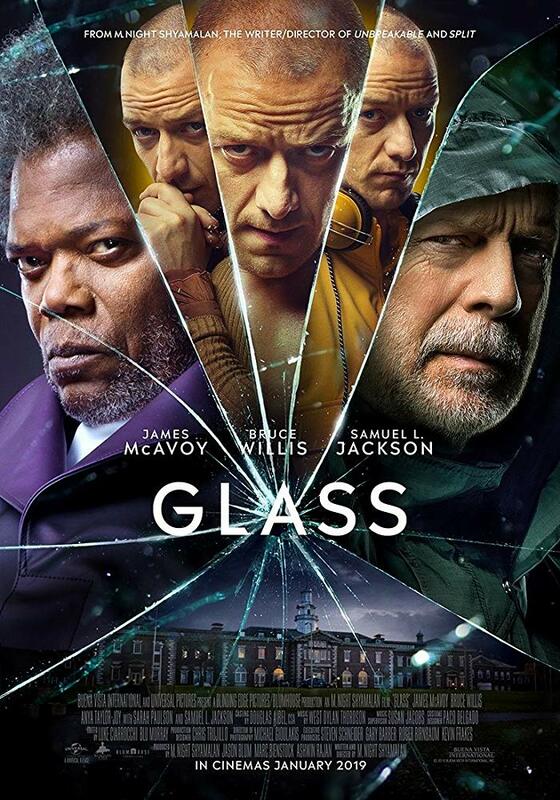 After watching "Split," the surprise sequel "Unbreakable," we were quite excited for writer/director M. Night Shyamalan's third installment in the trilogy, "Glass." Besides the "Unbreakable" trilogy Shyamalan is known for writing and directing such films as "The Sixth Sense," "Signs," and "The Village." This story picks up three weeks after the events of "Split" with Kevin Wendell Crumb (James McAvoy), better known as 'The Horde,' still on the loose, kidnapping and sacrificing young women to his "Beast" persona. David Dunn (Bruce Willis) has been using his gifts as a vigilante and has been tracking The Horde. Just as he faces off with him, both men are arrested and get placed in a mental hospital. Elijah Price (Samuel L. Jackson), better known as Mr. Glass, is also being held in the same hospital. All three are under the care of Dr. Ellie Staple (Sarah Paulson), who specializes in treating people who think they are superheroes. Dr. Staple tries to convince David, Kevin, and Elijah that they don't really have their remarkable abilities and are merely suffering from delusions of grandeur. Mr. Glass doesn't take too kindly to this idea and may be working on plans of his own to prove that they are, in fact, extraordinary humans with unique gifts. We started off as big fans of M. Night Shyamalan's work as he produced numerous twisty-turny thrillers and horror films we still enjoy to this day. He lost us when he released a series of painfully bad movies like "The Happening," "The Last Airbender," and "After Earth." He has been gradually winning our trust and patronage back in recent years with movies like "The Visit" and "Split," and we hoped "Glass" would continue that trend. To us, it does! We found this film to be quite compelling and thoroughly enjoyable for the most part. It falls right in line with the previous two installments in the series as Shyamalan offers a more grounded look at the superhero genre through the style of a suspense thriller that combines the psychological with the seemingly supernatural. We hear the explanations that Dr. Staple offers for the seemingly superhuman feats of David and the Beast, and we (and they) start to doubt what is real and what is merely perception. While Dr. Staple tries to persuade the men that they are 'normal,' Glass lies in wait to force an eventual final showdown between the Beast and David. We found it all to be a very entertaining end to Shyamalan's "superhero" trilogy. That being said, the script does have some cheesy dialogue and relies on a lot of exposition, especially in the second and third act. 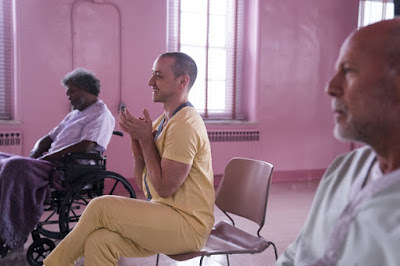 Luckily, James McAvoy does a fantastic job once again as Kevin, displaying multiple personalities just as he did in "Split" with the utmost success. He deserves so much more recognition than he has gotten for his role here. We think Sarah Paulson is an excellent new addition to series. Paulson is such an underappreciated actress, and she brings a calm intensity to this film as Ellie Staple. Overall, we were mostly taken in by the story in "Glass" and followed it all the way through to its climax. There are one too many endings, though. Still, the long ending didn't detract from our experience as a whole. We think this is definitely worth watching for fans of "Unbreakable" and "Split."